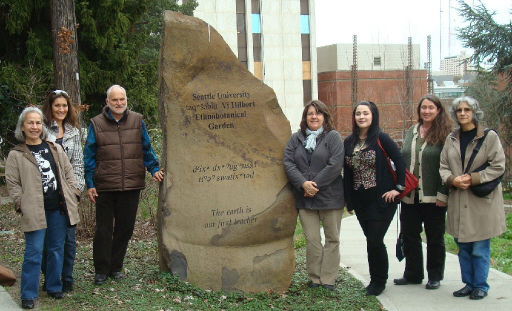 Recently the University of Washington Ethnomusicology Archives and Northwest Heritage Resources launched a new website called, Voices of the First People. 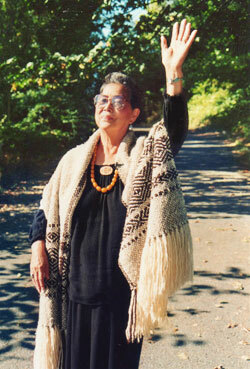 The site enables us to hear the voices of numerous elders sharing traditional stories, cultural wisdom and history. It is a beautiful tribute to the work of my late grandmother, Upper Skagit elder, founder of Lushootseed Research, Vi taqʷšəbluʔ Hilbert, and the collective wisdom of our ancestors. The new website is available on-line to the public and easy to navigate. The site provides categories that allow viewers to search information based on their specific interests and offers links to additional resources. The carefully selected video clips provide viewers the unique opportunity to see taqʷšəbluʔ’s graceful poise and eloquence. It was my grandmother’s dream to fulfill the desires of numerous elders she worked with, to document and share their information so future generations could benefit from their wisdom. It’s a treasure to see the video recordings and hear the voice of my late grandmother, the founder of Lushootseed Research, along with a number of scholars and elders. I raise my hands in thanks and praise to Jill Linzee, Project Director (NW Heritage Resources), Laurel Sercombe, Curator/Humanist (UW Ethnomusicology Program) and all the other individuals who created this beautiful, educational website. The Voices of the First People website will undoubtedly carry this important information to people all over the world. Lushootseed Research is dedicated to sustaining Lushootseed language and culture to enhance cross-cultural knowledge, wisdom and relations, as shared and celebrated by the First Peoples of Puget Sound, through research, recording, publishing and the presentation of oral traditions and literature. I was born and raised by Skagit (Lushootseed) speaking parents in the Skagit River area. It was my privilege to become educated from birth to the customs and language of the Indian community to which I belonged. As it was the custom for Indian parents to take their children wherever they went, my parents took me with them. I accompanied them to tribal meetings, Shaker meetings, winter longhouse gatherings, deaths and funerals. "It was the custom for Indian parents to take their children wherever they went." In the summertime we met and worked with people from many other tribes from Washington and Canada as we picked berries. This was a hard experience but one I consider valuable. It gave me the opportunity to observe how different people dealt with their lives. It showed me the strength and resourcefulness they utilized under different occasions and their capacity to endure hardship but find pleasure in sharing these experiences. In twelve years I attended 14 schools before graduating from high school. I graduated from Franklin High School, Portland, Oregon, in June, 1936. The sensitive kindness of Mr. Bell, the school principal, helped me to endure these two years in a big public high school. He recognized that it was a frightening experience for me so helped me in many ways. He took me to each of my classes and introduced me to the teacher. He boosted my self-esteem by charging the teacher to give me extra attention because I was special to him and he was planning to follow my progress. The teachers let me know that I could come to them any time I felt the need. They all kept their word. I had chosen to leave Chemawa Indian School to work as a domestic in Portland so I could be better prepared to function in an unsegregated world. I was paid $10 a month plus my room and board for the two years that I worked for these people. "It is a cherished legacy to the memory of our ancestors whose hearts would be gladdened to know that the culture of our people is being passed on to generations to come." After graduating from high school, I married and had three children. My oldest child, a son, born in 1937, died at age 3 of tubercular meningitis. My daughter was born in 1938 and a second son in 1943. Because it has always been my desire to see that my family is provided with the tools which will afford them a productive, happy life, I have worked to help provide them. Here are some of the things I have done: planned and operated a combination (café, gas and oil, groceries) business at Tahola, Washington; supermarket clerk; cookie packer, Danish bakery; shipyard welder; waitress, Chinese restaurant; Boeing food wagon cashier; Seattle Railroad School, telegraphy; secretary to the Director of Nursing, Children’s Orthopedic Hospital; Mr. Lee’s Beauty School training; since 1960 owned and operated a hairdressing business in one wing of my home; and currently I teach Lushootseed at the University of Washington. After meeting Dr. Thomas M. Hess in 1967, he began tutoring me in the study of my language. 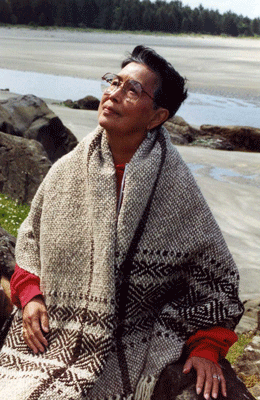 He taught the first Lushootseed class at the University of Washington in the spring of 1972. It was called Puget Salish that quarter. I audited that class and have since then been involved with teaching the classes at the University of Washington… Dr. Hess and I have written the material in the textbooks. All of the time I have spent doing this research to date has been an act of deep respect to my elders and a donation to our Indian youth. It is a cherished legacy to the memory of our ancestors whose hearts would be gladdened to know that the culture of our people is being passed on to generations to come. This is a rich inheritance to give each generation strength and pride in their race. ~ Vi passed away in her home, surrounded by family, on December 19th, 2008.